‘Bhuna‘ is a particular Asian cooking style where a sauce is reduced and reduced until it is so thick that it just clings to the meat, making the meat appear ‘browned’. Dishes cooked in the bhuna style are rich and pungent, the flavour of the spice mix concentrated down by the fierce reduction of the sauce. Bhunas tend to be hot for the same reason.
. Her recipes are outstanding. To make a lamb bhuna, start by gently browning a heady mix of spices. Add two teaspoons of cumin seeds, four teaspoons of coriander seeds, two teaspoons of mustard seeds, two or three dried chillis, and finally two teaspoons each of fennel and fenugreek seeds to a large, dry, medium hot frying pan. Keep the spices moving for a minute or two until they brown slightly. Empty the pan into a bowl and let the spices cool slightly before grinding them to a fine powder in a coffee grinder of with a pestle and mortar. Next, finely chop three large shallots, a four centimetre chunk of ginger and five or six garlic cloves in oil in a large pan until they turn golden brown. This will take maybe four or five minutes. Add a couple of medium tomatoes, peeled and chopped to the pan, along with about fifteen curry leaves. Feel free to use canned tomatoes instead of fresh. Cook until the sauce thickens. Add the roasted spice mix to the pan and stir well. The dry spice powder will cause the sauce to seize and thicken. Cook for a minute or two, taking care not to let the sauce catch on the bottom of the pan. If it does, add a splash of water and quickly stir. Now add a kilo of boneless lamb or mutton shoulder, cut into large chunks, and a teaspoon and a half of salt. Stir and cook for five minutes, making sure that the meat is fully covered in the thick sauce. Let the curry down with 250ml of water, bring to a gentle simmer, put a lid on the pan and cook on a very gentle heat for about an hour and a half. After this time, check that the meat is tender. If it isn’t leave it for a while longer. When the meat is ready, remove the lid from the pan and turn up the heat to reduce the sauce until it almost disappears. The aim is to create a dry dish, where the highly concentrated remains of the sauce cling tightly to the tender meat. Finish with a sprinkle of garam masala and a handful of chopped fresh coriander. Serve with naan bread, rice and cold beer. This is no place for wine. Beer only, please, something light and very, very cold. I'm not sure what i did wrong but i followed the recipe to the letter but it tastes really sour. Ah well nothing ventured, nothing gained. Could have been the balance of the spices…too much fenugreek, maybe? Different batches often vary in strength. I’m Asian and I never drink alcohol with my meals especially with Asian dishes because the flavours of Asian cooking are superb and complex and wine, beer or anything alcoholic just ruins the flavor of what I’m eating. It’s okay with western style meals because they are generally bland and no one flavor stands out. indian dishes are quite complex and it takes time to get it right. It took me months and lots of Indian, Nepali, afgan, Malaysian and Indonesian cooking curries before mine turned out right. My Indian friends encouraged me all the way. Constant experiments will also help in correcting a dish that doesn’t taste quite right. Among Asian cooks, it is understood that no two people will cook the same dish the same way. 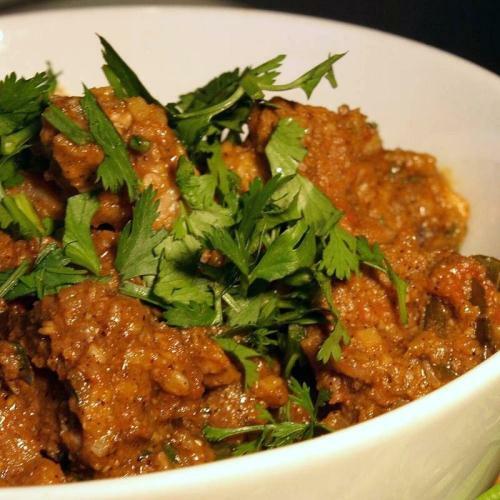 My favourite bhuna gosht recipe is the one from http://www.greatcurryrecipes.net. I use vegetable instead of mustard oil. It is outstanding. I have jaffrey’s curry bible cookbook but I prefer this version. I’m going to follow this recipe today so fingers crossed i’ll get it right. I can’t track down fenugreek seeds so i’m going to use dried ground fenugreek which is hopefully an alright substitution! The powder is a little old so won’t be at max flavour but I saw the comment above about sour taste and your idea it might be due to fenugreek so maybe that’s a good thing! On a side note, i’m also going to experiment today with making a home version of one of my takeaway favourites, Chicken Chaat Puri – is this a dish you’re familiar with? It’s basically an indian style hot sweet and sour chicken starter that comes with a large pancake like fried unleavened bread to wrap bites in. I’m in unfamiliar territory with amchoor powder and tamarind pulp and chaat masala, lol. This looks absolutely delicious. I love Lamb bhuna, but have never made. I just order it at my favorite Indian restaurant. This looks like a great recipe that I could make at home! I used onions and red chilli powder as I did not have any dried chillies. I also had no fenugreek but the curry tasted delicious! One thing I have learned is using cheaper value chopped tomatoes from tins. Italian tinned tomatoes are great for many other dishes but I find they can make curries taste more sour or too tangy. I also added chunks of fresh tomatoes, cut in 4 pieces and chopped large pieces of onion 15 mins before turning off the heat, this made the curry really juices with each mouthful! I tried making this recipe last night but it didn’t turn out how I’d expected. The meat came out very tender and tasted nice, but it just didn’t really taste that much like a curry. The only thing I did differently was to add more than 250ml water (maybe more like 400ml) – I was using a shallow pan and didn’t want the meat to stick. I wouldn’t have thought this would have made much difference. Any tips/ideas where I went wrong? Quite probably too much water. The sauce should be quite thick and clinging to the meat. Try adding less water and keeping the heat lower if it looks like it might stick. No, that’s not quite right … two teaspoons of cumin and four teaspoons of coriander are the correct measurements. Using tablespoons would just be too much. I have madhur jaffreys curry bible, and for a kilo of lamb it’s definitely tablespoon not teaspoon if cumin, coriander and mustard seeds. Honestly, it’s teaspoons, not tablespoons…the recipe is quite correct as written above. Four tablespoons of coriander and a couple of cumin would be far, far too much! Everybody who has tried this and has ended up with a watery, slightly bland curry has simply not cooked it long enough. I’ve done this particular recipe 3-4 times and it has turned out perfectly each time. When I fist cooked it, after 1 hour 30 I tasted it and it was not nice to say the least, quite bland and bitter! Naturally I panicked and presumed I had made a mistake but decided to leave it to cook for longer. I think it was another hour but I basically cooked it in to all the liquid has evaporated and i was left with a sweet and stick sauce that clung to the meat. YOU NEED TO REDUCE ALL THE LIQUIDS. …this is absolutely true. A bhuna should have a very thick, clingy sauce. It’s only when the sauce gets properly concentrated that the real flavours come through. Just keep reducing. Ah, yes. My mistake. That’s been fixed now, so all future shopping lists should be OK.
I’ve made this many times and it always tastes superb. I use dried Fenugreek as I can’t get the seeds. The only down side is that my house smells of Lamb Bhuna for days after. In my opinion the amount of fenugreek seeds is far too much.If using them at all I would count about 15 seeds. fenugreek is bitter so I only use small amounts. Tamarind is very acidic and I use it sparingly. Amchur is dried mango powder and enhances the flavor of Indian dishes. How many do you think this would serve please 6-8? No, closer to 4, but it’s easy to double it up and it freezes well.